Efficient product designed to clean throttle butterfly of injector, valve of exhaust gas recirculation system (EGR) and carburetor. Quickly softens and removes all kinds of contamination. Restores operating parameters of the mechanism to the nominal ones. Decreases harmful exhausts emissions into the atmosphere and reduces fuel consumption. Spray a large amount of the product onto a throttle butterfly (into induction manifold of air supply) on a warmed-up non-running engine. Operate the engine at increased speed for 3-5 minutes. Take off an air filter. Start the engine. 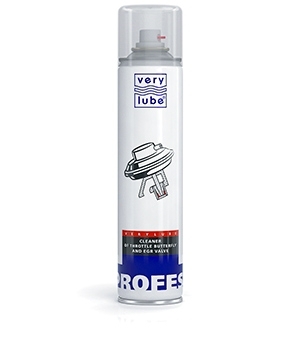 Spray generous amount of the product onto all visible parts of the carburetor. During cleaning, maintain increased engine rpm with a lever of the throttle butterfly.